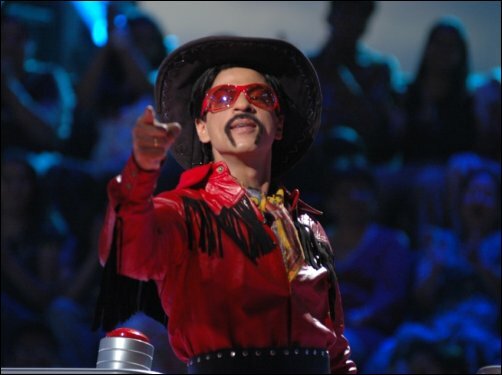 Here is a picture of Shahrukh Khan as Quick Gun Murugan (character played by him in Om Shanti Om) in his reality game show Kya Aap Paanchvi Pass Se Tez Ho. This special episode will be telecasted on 22nd June 22, 2008. I have no idea how Southern Superstar Rajinikanth took it because the character was taken from one of his movies where he plays a cowboy. Yeah, a cowboy in Chennai! I happened to catch the movie on TV few weeks back and was not able to stay in my chair…yeah, was falling off laughing. Coming back to Shahrukh Khan, he has done everything to save the show from bringing Kareena-Saif, Harman-Priyanka to Rani-Karan, but it seems that things are not working in his favour this time. Let’s hope this Quick Gun act works for him.